This Ongoing War: A Blog: 6-May-12: What lies behind freedom of the Palestinian Arab press? 6-May-12: What lies behind freedom of the Palestinian Arab press? Robust, noisy, vigorous: Israel's media. We posted earlier today ("6-May-12: Are the Palestinians getting the freedom, the funding, the support that they demand from the United States? Yes and no") about the exquisitely well-funded, oh-so-angry professionals of the territory controlled by the Palestinian Authority. We noted how much of the funding that makes their temper tantrums possible comes from the United States and its taxpayers. We also referred to the distinctive form of last week’s celebration of press freedom in the world of the Palestinian Arabs. Hamas routinely attacks Gaza journalists and who disagree with its policies. Right now, there is no freedom of the press in Gaza and reporters self-censor out of fear for their lives. They have beaten journalists who try to cover anti-Hamas demonstrations, they have banned Fatah newspapers from Gaza, and they have even attacked documentary filmmakers. This past October, the terrorists of Hamas engineered a forcible takeover of the Gaza headquarters of the Palestinian Journalists' Syndicate. Then in March, Hamas "security forces" physically attacked three journalists while they were covering a Gaza City event, assaulting and beating them. [See this Palpress report in Arabic.] If you look at the names and professional affiliations of the victims, you might be persuaded to expect some kind of global media outcry: Muhammad Masharawi, a reporter for SKY News (who suffered the additional indignity of being abducted by the Hamas thugs immediately afterwards); Adnan al-Barsh who reports for the BBC; and a journalist by the name of Amer Abu Omar. As far as we can tell (and we're open to being corrected) neither SKY nor BBC gave any coverage at all to what was done to their own people. Sadly, there's a long tradition of foreign news media hushing up the intimidation their field people experience in the dark corners of the Arab world. Israel, with its robustly open and unrestrained media channels, comes in for what we consider unfair criticism from certain quarters. Though it ranked first in the Middle East and North Africa group analysis of Freedom House this year, and was the only country in the region that received a “free” rating, Israel gets plenty of flak. For instance, the press freedom index published by Reporters Without Borders put Israel at number 92 in 2011, a drop of six places from the year before. Our sense is that some of the negativism is based on distortion and misuse of statistics (here’s a cogent analysis). Some of it, we believe, is tainted with straight-forward malice. But we think it's instructive to dig below the data. Understanding the case of one particular journalist whose story has never properly been told, but who has been featured in reports of how Israel infringes the freedom of the Palestinian press, might be helpful in this respect. In 2001, when this woman was 21 years old, she worked as an on-camera news reader for PA Television's evening news, based in Ramallah. Several days after 9/11, the Israelis arrested her and subsequently she spent time in prison. It’s reasonable to assume that her case would - and in fact it did - attract criticism of the kind that is frequently directed at Israel: the alleged abridgement of the freedom of working journalists to do their all-important reporting work, oppression, harassment etc etc. She was eventually released. Since February 2012, her career has been on a sharply-upward trajectory. She got her own glossy television program that is beamed by satellite every Friday night into all parts of the Arabic speaking world via the Al-Quds TV channel. That's one of two global-facing television channels operated by the Hamas terrorist regime; the other is called Al-Aqsa TV. Her weekly program, "Naseem Al Ahrar" (translation: “Breezes of the Free”) focuses on the injustices allegedly visited on Palestinian Arab prisoners languishing in Israeli custody. All in all, it would be fair to say that at the age of 31, this woman possesses one of the most prominent and influential platforms that an Arabic-only journalist could ever dream of having. 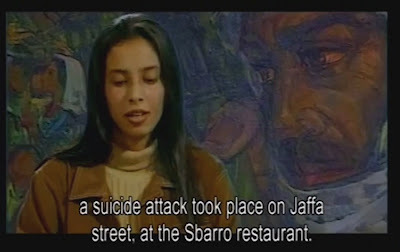 In the screen shot below you see her reading the evening bulletin on a Palestinian Arab television news program beamed from Ramallah on Thursday August 9, 2001.
learn who this woman is. That night, seated in the Ramallah studio a few minutes drive north of here, her hair uncovered in Western, non-Islamic style and dressed fashionably, she read from the prepared script about a terrorist outrage (trust us on this: the script writers did not call it a terrorist outrage) that had paralyzed and shocked nearby Jerusalem some hours earlier the same day. The demands of journalistic objectivity meant that, whatever personal feelings she must have had, were kept under control, sheathed and hidden. But ten years on, we know something now about those repressed and unseen passions. That’s because this journalist is a woman called Ahlam Tamimi. She was the planner and engineer of the massacre about which she laconically reported in the evening news. It was she herself who had placed the bomb that ripped through Sbarro, a pizza restaurant in the center of Jerusalem earlier that afternoon. The bomb, who had been a human being until 2:00 pm that afternoon (no misprints here - read it again), had been ‘enhanced’ with steel balls and nails to enlarge the impact on passers-by. And indeed it had that effect. 130 people were mutilated and maimed. Fifteen more were killed including our teenage daughter Malki. Most of the dead were children, like Malki. A sixteenth person, a young mother who had popped in to the Sbarro restaurant that day for a quick lunch with her two year old daughter, suffered severe injuries and has remained comatose for the ten years since then. Her daughter is now twelve and is being raised, alone, by her father. That most of the dead and injured were women and children is mostly due to Tamimi's diligence. In accordance with the instructions of her Hamas masters, she herself in the couple of days before the attack had walked around downtown Jerusalem looking for, and finding, a target for the massacre (as she herself has said on public video) that had the optimal concentration of Jewish women and children. She has boasted on television that her priority was to find a restaurant that not only attracted Jews but that attracted religious Jews, Orthodox Jews. They were her principal target, she said. And for this purpose, Sbarro – with its well-advertised, highly-stringent kosher supervision - fit the bill. Tamimi the journalist, no longer bareheaded and dressed like a Westerner but now attired in the shape-concealing garb and head covering we associate with Islamist females, is free as a bird to travel wherever she likes. She got out of prison, despite the thousand-plus year sentence, in October 2011. Today she has a Facebook page, an army of supporters and acolytes, a highly public persona, large and enthusiastic audiences. If the circles in which she moves had a culture of idolizing female rock singers, Tamimi's standing would be on that level. But they don't. What they have is Tamimi. When her appearances are announced, the crowds gather. She embodies something profound and powerful for a large and very specific segment of the world's population: a literally-lethal blend of Joan of Arc and pop diva. It's arguable that no murderer in history has had as much opportunity as Tamimi to unashamedly claim credit for the killings of which she was charged, tried and convicted. Certainly no one who was sentenced to sixteen life terms in prison has ever been interviewed as a perfectly free citizen (of the Hashemite Kingdom of Jordan, for the record), openly exulting in her 'achievement', asserting again and again that what she did was right, proper, good, justified. And encouraging others to do what she did - to kill. Are we overstating any of this, or its impact? Let whoever knows of such statements send us a link to a public statement in the Arabic language - written or spoken - expressing embarrassment, regret, even discomfort, at the emergence of this woman as a hero of her people. Even a statement simply criticizing her and the murders she executed. From anywhere, just so long as it appeared in Arabic. This woman's horrifying career and its impact on the world she occupies throws more light on the life and values of our neighbors than a free press alone, which they have never had, would or could. justice, in this world, is powerless to fully punish this terrorist. (and, one must regret the staggering confusion and the monstrous stupidity that led to the terrorist's release.) nonetheless, to the extent that justice can be brought to this terrorist, it should be. she and her collaborators should be made to drink deep from that cup.